Working 9 hours a day in an isolated cubicle for a corporate company or any sort of company is not everyone’s cup of tea. Although companies offer attractive packages to their employees, not everyone have the knack to do the same kind of job every other graduate usually does. Sometimes employees tend to look for a more unconventional career option that suits their personality and also fill their pockets at the same time. Yes, they might not pay as much as multinational companies do but they can be a really fun, entertaining and often enlightening. There are several out of the box creative careers that are in demand right now. 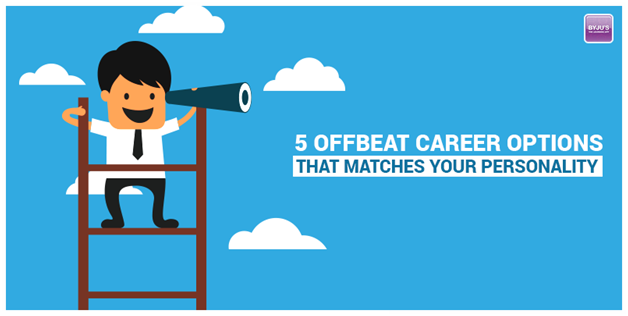 Let’s take a look at a few of these offbeat career options that might match your personality. With the rise of industries and technology, new and new factories and industrial plants are popping up everywhere. In fact, these industries are chopping down natural habitats and all the living wildlife species along with it. With this growing concern, the world needs more wildlife conservationists who can protect the, Flora and Fauna, wildlife animals and conserve their species and prevent them from being endangered or going extinct. If you love animals and nature, this is the best job for you. Blogging has gone from an internet hobby to quickly becoming a money making professional career within no time. The boom in the internet industry has made blogging a money making resource of many pro-internet geeks and surfers. Bloggers are a sort of brand influencers and most of the big companies have noticed the impact blogs related product, food, etc reviews have on the customers. Bloggers can express their views and tips while sitting at the comfort of their home with full access to the knowledge available on the internet. People have a knack for writing and passion for the latest gadgets or food etc can make blogging a full-time profession. As we know, YouTube has revolutionised the digital with its vast array of videos online and the freedom to watch and upload unique content. Not everyone is familiar with the fact that, YouTube pays for you uploading videos. Yes, you can make money through Youtube via the YouTube Partner Program. All you need is a good idea and screen presence and lot’s of viewers. If your content is really good, you can also receive sponsors and target advertising. Mobile applications are the latest trend in this tech savvy generation of ours. These apps have quickly become a daily part of our lives with the demand for new interesting apps on the rise. The technological industry is looking for people with creative mind who can up with the most innovative and smart idea for a mobile application that could soon become the next big thing. Apps like Whatsapp, Tinder and Snapchat have become sensational since their introduction. So if you have knack for bright ideas and technology your app could also become the next big thing. Apps related to Math or maybe education are also in demand at the moment. With all the hustle and bustle involved in everyone’s busy chaotic world, owners often do not find the time to spend with their beloved pets. But that’s where you can come in. If you are an animal lover and are fond of spending time with furry little pets, then Pet grooming is the perfect job for you. Spend your day with pets and groom them while getting paid for it. Owners don’t mind shelling money on behalf of the maintenance of their furry companions. This possibly the most fun filled and happy job you can find.